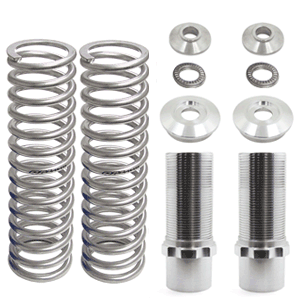 UPR Products Coil Over Kit with Springs. Our kit features a military type thread so it won't vibrate or seize. This is a revolutionary new design we have just come out with to eliminate the headaches of lost adjustment. We also utilize a nylon tipped set screw to lock in the ride height. Our kits now feature a custom Anodized Finish to ensure the highest quality and best looking kit available! Installs in 1.5 hours or less. Most struts will require the removal of the dust shield in order for the coil over sleeve to slide over the top. 1979 1980 1981 1982 1983 1984 1985 1986 1987 1988 1989 1990 1991 1992 1993 1994 1995 1996 1997 1998 1999 2000 2001 2002 2003* 2004* LX GT GTS Bullitt Mach 1 Mustang Cobra Roush Saleen & Steeda Vehicles. * Does not fit Cobra with factory Bilstein Struts. No one else can stack up to the bold clean styling of our aftermarket Billet dress ups, Street Strip & Racing Suspension & Performance Parts for your late model American Muscle Car!